Lepidolite is a type of Mica that often occurs around Pink Tourmaline crystals. It is rich in lithium, which brings about its spectrum of colors. It can form in many different colors such as pink, purple, grey, white, and colorless. Lepidolite’s known locations are Africa, Brazil, Greenland, and USA (in Auburn, Maine and San Diego County, California). Lepidolite is very effective in stress relief, aiding in the release of worries and aligning one with acceptance - of the self, of others, and of one’s life situations. This stone is perfect for situations where the “going gets tough”, as it not only settles and replenishes the emotional body, but also provides enlightened energy that helps one to handle situations according to the highest path. It aids in preserving integrity and well-being when dealing with angry people, financial stress, loss of job or relationship, or the need to make big changes in a short time. It is most effective when life is most challenging. The aura of serenity that Lepidolite gives off branches out in many directions. This is an impeccable aid in responding to all forms of hostility without getting defensive or angry. It helps one to easily find a harmonious course of action and to see any problem that arises as a way of learning. It enhances physical grace making it excellent for those who feel clumsy or self-conscious in physical movement. Lepidolite also provides eloquence in speech and helps one to listen to others with compassion and patience. It has an acceptance aspect that is very effective when one is depressed, allowing one to dive into the sorrow and understand it rather than resist it and continue to suffer. We recommend using water in meditation with Lepidolite, try taking a warm bath with one or more stones. Since it is a water element stone it will effectively spread its calming influence throughout the bath and through one’s energy field. Water is also useful in cleansing this stone. Lepidolite is an amazing ally in dreamwork, preventing nightmares, dream recall and curing insomnia. It is recommended to place it under the pillow or above your head before bed. This stone can also be used to locate the sources of the body’s disease and blockages by moving it along the body until it gently vibrates. Once the blockages are found, it can clear the blocked energies around them. 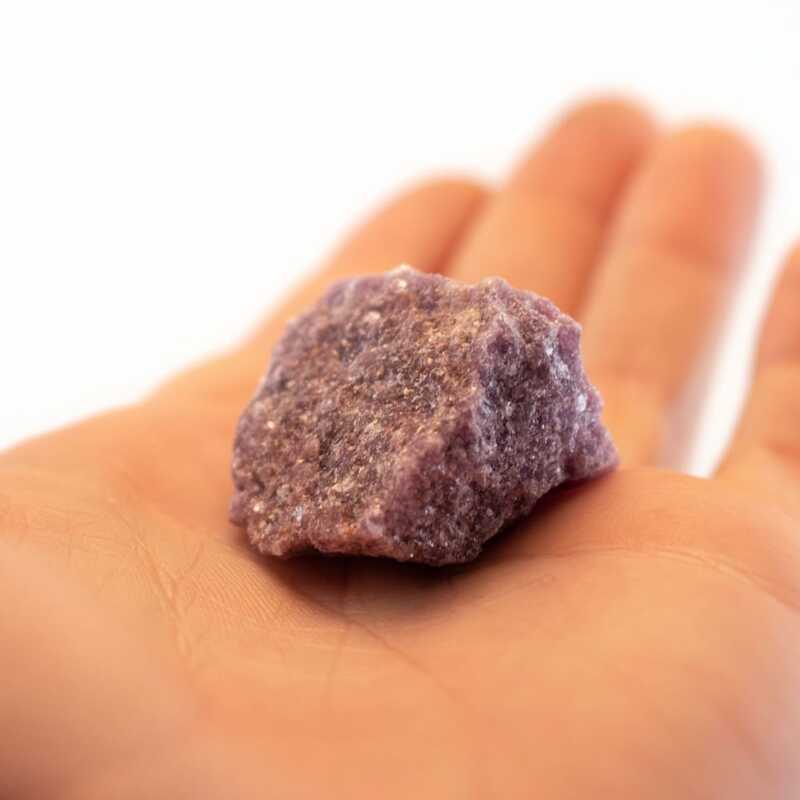 Lepidolite can also be placed on parts of the body suffering from nerve pain, sciatica, neuralgia, and joint issues to ease and reduce the symptoms. Lepidolite is an expansive stone, stimulating all chakras but especially the Heart (4th) and Third Eye (6th), allowing one to link to the Divine Presence or Higher Self. It releases fears of the unknown future and assists in maintaining faith that all is working out for the best. Lepidolite releases one from any negative attachments to the past that hold one back from happiness and success. It aids in attracting opportunities for success as well as friends and colleagues to support one in life’s endeavors. Lilac Lepidolite is a type of Lepidolite, rich lavender in color with some translucence. It shares most of its traits with general Lepidolite but more specifically stimulates the Heart and Crown. This blends the energies of the heart with those of the Divine, creating a link bewtween the two. This stone is of great assistance in maintaining the Heart-Divine link as well. Lilac Lepidolite places large emphasis on the occurrence of synchronicities and one’s awareness of them. This variety of Lepidolite also adds a storm element to the stone making it resonate with both water and storm energies.